1. Prepping — I find that basting my quilt is an important step for this endeavor, not that it is not an important step in other forms of quilting. But you see, for domestic machine quilters, we do not have advantage of stretching our quilts over a frame for longarm quilting to take out the slack. If there’s too much slack in the quilt sandwich, I would more than likely encounter the dreaded bubbles (extra humps and lumps) when I do overall quilting. So, I normally press and starch my quilt top really well before basting when I know I am doing an overall quilting motif on a quilt. 2. Related to the aforementioned matter, I pin, pin, pin, and pin my quilt sandwich like crazy. I pin baste all my quilt sandwiches, and I normally use lots of pins anyway. But for overall quilting, I use even more pins. 3. The important thing in overall quilting is to have an even overall look. I think that’s really tricky for domestic machine quilters because we only have that teeny little area we can see around the needle. So, it’s very important I know the motif well so that I would not stumble what to quilt and where to go next. 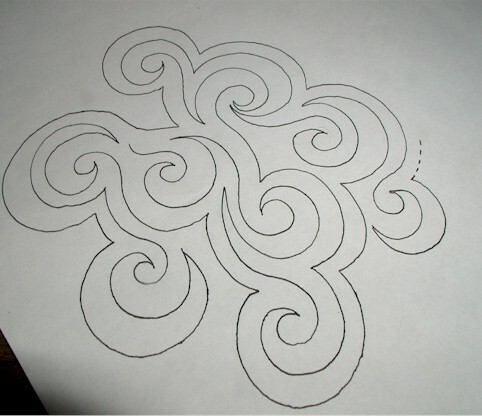 Be ready to whip out an extra curl, or swirl, at a moment’s notice to fill in just that area where I can’t fit in an entire motif. 4. Oftentimes, I have to stop and see which area needs more filling, and I have to go back to the area for more quilting. Unlike a longarm quilter, she gets a better bird’s eye view on how things look on her quilt, and the chances of having to go back and fill in an area are probably lower. But there’s certainly no shame in having to go back over areas. 5. Lastly, I find that I definitely have to square up my quilt after quilting an allover motif because of all the handling of the quilting in trying to fit my quilt under that tiny throat area of my machine. But squaring up one’s quilt before binding it is just good practice anyway. One last thing before I leave you… meandering/stippling over an entire quilt is definitely a form of allover quilting. If you are looking to allover quilt, but do not want to meander or stipple and want to do something different, why not try these swirls and add them to your repertoire? 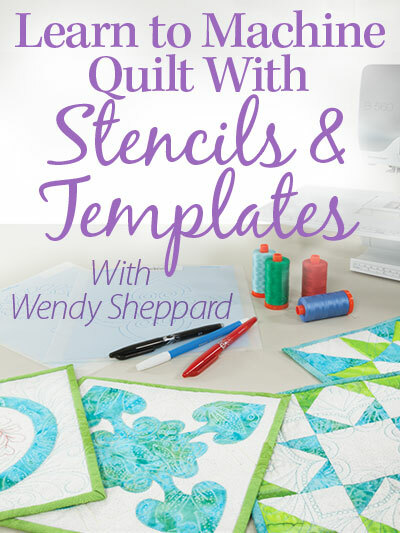 I hope this post gives you that extra boost in getting you out of your quilting comfort zone and try something different! As you can see from my pictures, it is possible to quilt like the big girls with your domestic machine. Give it a try! 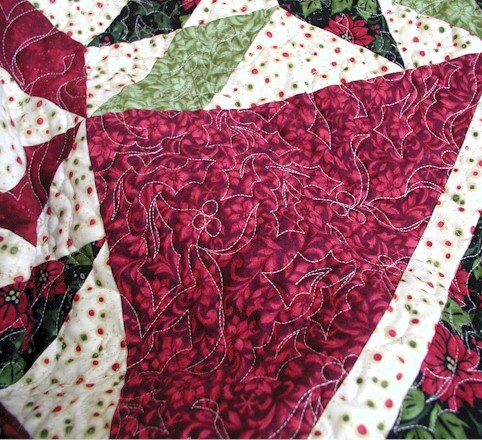 This entry was posted in Freebies, Ideas, Tutorials, Thread Talk and tagged Domestic Machine Quilting, Free-motion quilting tips. Bookmark the permalink. What a fantastic post, I find you are so good at putting all the info so well into words. I tend to do mostly custom, lots of ditch stitching first then on to the design, but occasionally I have a customer who wants an all over design, stipple, vine, flower,heart meander and the like.I have found like you because I am using a domestic machine, we have some limitations, but also some freedoms that Long Arm quilters don’t have.I have had a quilt recently from a customer that had problems with her quilt and was a bit upset with how her top turned out (wavy) I suggested a all over design (also conscience of her limited budget) and it worked out great, yes it had wavy bits, but it would have been more problematic if it was custom quilted, anyway she was so happy with the quilt and now has a new love for it. I just wanted to let you know how much I enjoy your Thread Talk. Even though i have been quilting for over 10 years, I am very new to machine quilting and I find your posts invaluable and inspiring. 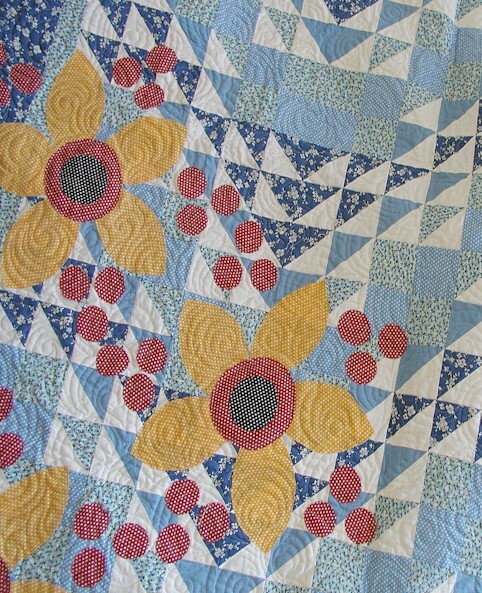 I constantly try to find the courage to do allover quilting on my machine, Id really like to try – and I will one day…. :o) I really like the swirls, have to practice drawing them, thanks! What a great post, it’s always so good to have someone who’s quilting is excellent share how they do it. 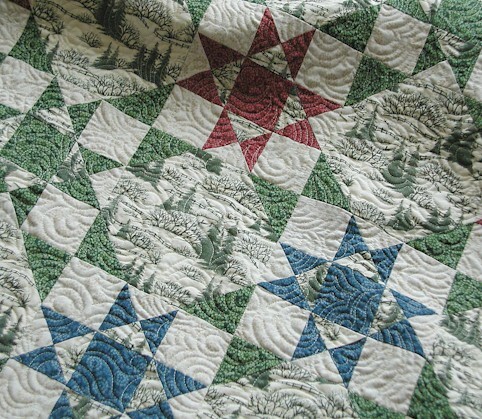 I was wondering if when you pin and are actually sewing do you remove the pins in the area you are working on or do you just sew around the pins and remove them all once you have completed the quilt? I have learn’t so much from your site and posts. Loved that post Wendy – it was very informative. Those swirls – I need to PPP and get them into my tiny brain. 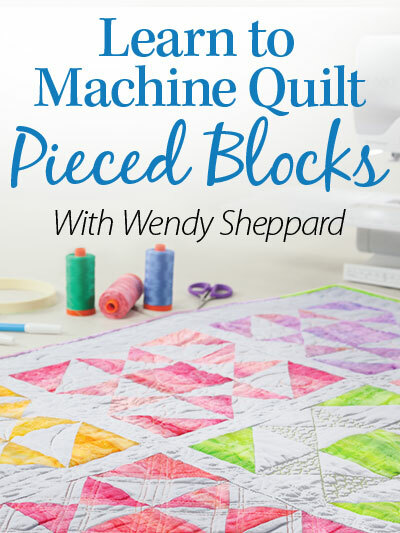 I always admire that FMQ as its something I really find hard…I tend to try to get my quilting a bit ordered…I will get there though I hope – I just need to jump in…- You do your quilting so well – I love to see that! Such a wonderfully encouraging post full of great information! Doing swirls is something I really want to learn to do. I tend to have problems getting round shapes smooth and not jerky or pointy. Any tips? You have a way of explaining things to where it is easy to understand. 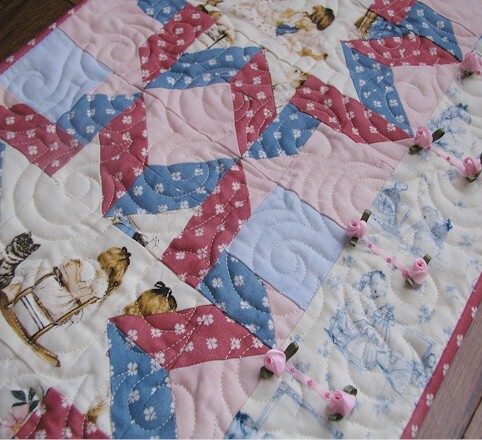 Do you feel the pins get in your way of quilting? I do a meandering stitch (not as wonderful as yours) but I do not pin as much because I am constantly taking out pins. What an insightful, detailed, and thoroughly helpful Thread Talk! You are very generous with your knowledge and education, and I for one am very grateful. I have quilted all over designs, and have done them fairly well, but reading through your explanations and insights gives me greater understanding of the process. No one else has done a better job of imparting such wisdom. Wendy, you are one in a million, and I couldn’t appreciate your expertise more! I think my brain is too old to remember all that. You are amazing. I did however try FMQ on my Grandfather’s Portrait Quilt on the borders. I just followed the leaves and did stipple in between. Good thing the fabric is dark LOL I did not do a great job I know I go to fast. I spent some time yesterday watching Utube FMQ and they all seem to go slow. I really think you have to be an artist with a needle and you sure are. Love how you put it all into words too. I am your fan. Excellent and informative post, Wendy! You’ve given me a lot to digest…now if only I’d get off this computer and start putting together those quilt strips. LOL! Quick question, just ’cause I’m curious…What type of pins do you use to hold your quilt sandwich together? 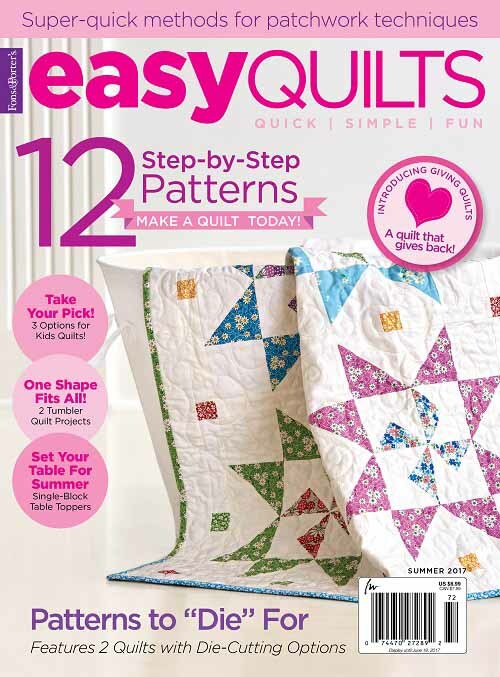 love your musings about allover quilting. i am curious about what kind of sewing machine you use in general. OMG Wendy…I really thought you were a longarmer!!! 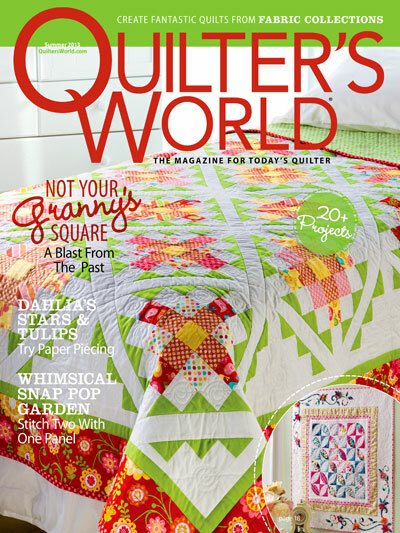 Your quilting is just beautiful…wonderful article. Thanks for the info and inspiration! I tend to stick to the meandering type of quilting because of not know what else to do. You are giving me the courage to jump off on some of those swirls. Wish me luck. Wonderful post! I’ve never tried quilting something large w/o stitching in the ditch first, but I have a quilt coming up that needs an over-all design, so I’ll put your advice to work! One question – do you still start in the middle when you are doing an over-all design? 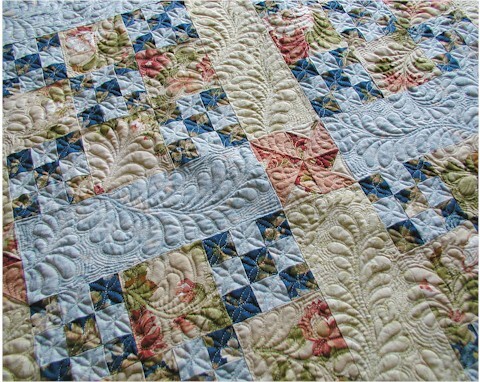 I have always pin basted my quilts. I’ve had a few disappointments with bubbles turning up on the back, even after I pin, pin, pin, and try my best to smooth it all out. Recently I tried using the spray basting, and I was totally thrilled with my quilt sandwich. It was easy to maneuver and NO bubbles on the back!!! 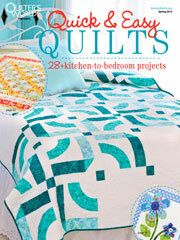 I’ve always been hesitant to quilt a large quilt, but I think I will take the plunge now. Thanks for all the great hints. YOU USE A MACHINE AT HOME… I had no idea… and this is just beautiful. You are an encouragement to me, I have decided to stop spending money to have others do my quilting. Seeing your work, now I know it is possible. I have had the bubbles – tried to baste with thread, and found it ties around my foot most of the time. Now I pin, but will take the tip: Pin pin pin!!! I will put more next time. Thank you for showing us your beautiful work! I don’t do a lot of machine quilting myself but I do like the tip about spray starch the quilt. I think that is a great tip and will give it a try. Every time you post one of these quilting posts, I get a bit more brave and think I’ll try some free motion quilting. Thank you for all the wonderful tips! You’re encouraging me to swirl… I’ve only done stippling and still trying to perfect that. Thank you for all your inspiration and encouragement. Luv, Luv. 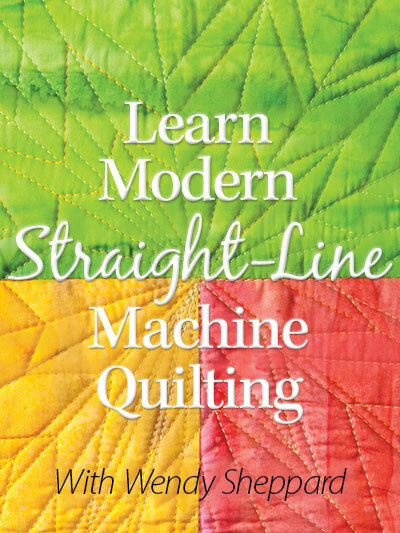 I love your machine quilting tips. I have benefited so much from all of your information. I especially want to thank you for the thread information. Wendy, wow, I didn’t realize before that you do all of your quilting on a domestic. I’m more inspired than usual. :) I’m finally quilting a large-ish quilt, 55×78 on my new Janome Horizon, and so far so good. It’s been 5 months of not free motion quilting, due to life, so I’m feeling a bit intimidated. I’m doing an overall stipple/meander to get back into the swing of things. Wait, I just reread this post and noticed you mention starching when you do the final press just before assembling your quilty sandwich. Starch? 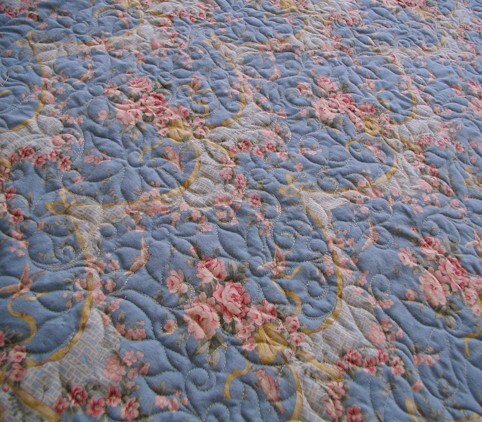 Do you ALWAYS use starch before you layer your quilts, or just with certain allover designs? And do you starch the backing as well, or just the top? I’ve never heard of starching at this point but I’m sure you have a good reason. Is it to help prevent distortion, or to make the quilt slip around on your sewing surface better, or for some other reason? I’m still plodding along on my Drunkard’s Path blocks and starting to think ahead to the layering and quilting ahead. I’m hoping to try some free motion quilting but I’m terrified of ruining all my hard work. I just stumbled upon your blog about 4hrs. ago and have been workiing my way through your “Freebies, Ideas etc” ever since…… so much for watching the Olympics!!!!! First of all I want to thanks you for all of your “sharing”. How do you have time to do all this “giving of info” and find time to quilt???!!!! Question re: Squaring Up Your Quilt” If you have a pieced boarder or an applique boarder how do you square it up without loosing your 1/4″ seam allowance- thus end up ruining the integrity of the pattern or getting closer to an applique in places? I guess that is why people use a wide outside boarders if it ends up 5 1/2″ w instead of 6″ in places in order to square it, it is not “that ” noticeable. But if it were a competition quilt I’m sure it would be noticed. I hope you understand what it is I’m asking. To you purposely make that outside boarder large than what a pattern calls for so that ajustments can be made? But it still would be uneven in lplaces. Thanks again for you wonderful blog. This is a great idea! I love the fact that we can try to use a different design on home machine for all over quilting instead of stippling. I usually just end-up doing block specific designs if I quilting on a DSM.